In a month or so my friends and I intend on visiting the Adirondacks again in the late Spring. It’s been quite some time since we visited at this time of year. I had just started in a new job for a few months and this was my first little bit of time off over a long weekend. My friends and I drove into the Adirondacks region for the first time. Unfortunately we arrived when it was raining so rather than try and set up camp immediately and make dinner, we found a small local restaurant serving mainly the campers in the area. 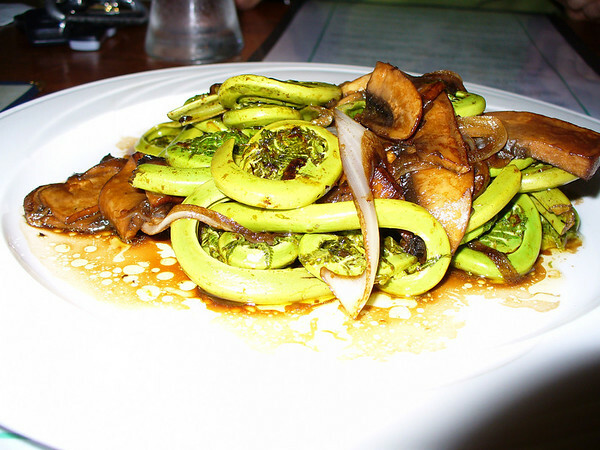 My friend noticed that they served fiddleheads and exclaimed we had to try them. I had no idea what they were but apparently they were only picked at this time of year because they eventually will grow and become too hard to eat. Anyhow, after we finished enjoying our meal and got back to our campsite, the rain had stopped. At least, long enough so that we could comfortably set up our tents and avoid the rainfall later that night. The next day was a beautiful sunny one. I’m looking forward to hiking in the Adirondacks once again in the Spring. A nice quick road trip to satisfy the travelbug until July. Don’t know if I’ll have fiddleheads again but we’ll see! Currently, we’re looking at what trails to hike while we’re there for a few days. Recos would be great if you’ve got any!